Pallavas ruled Tamil land .. .. the Pallava dynasty existed from 275 CE to 897 CE, ruling a portion of southern India. They gained prominence after the eclipse of the Satavahana dynasty. They were a great force to reckon with during the reign of Mahendravarma I (571 – 630 CE) and Narasimhavarma I (630 – 668 CE) and dominated the Telugu and northern parts of the Tamil region for about 600 years until the end of the 9th century. Throughout their reign they were in constant conflict with both Chalukyas of Badami in the north and the Tamil kingdoms of Chola and Pandyas. Pallavas are most noted for their patronage of architecture, the finest example being the Shore Temples at Mahabalipuram. Miles away, the buses are one of the principal icons - the archetypal red rear-entrance AEC Routemaster being recognized worldwide. 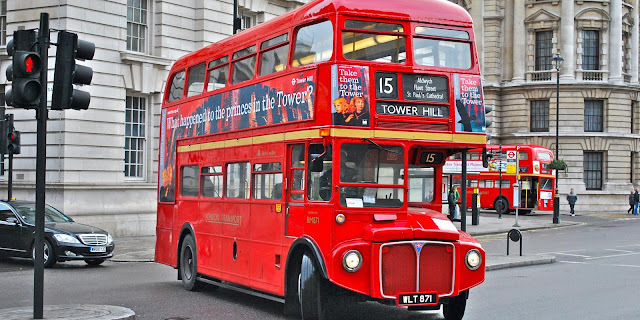 Although the Routemaster has been phased out of regular service, with only one route still using the vehicles (15H), the majority of buses in London are still red and therefore the red double-decker bus remains a widely recognised symbol of the city. London's famous red buses form a big part of getting around in London. Although the London Underground is the fastest and for newcomers the simplest way of getting around London, the buses play their part and are an experience one should experience in London. Buses have been used on the streets of London since 1829, when George Shillibeer started operating his horse drawn omnibus service from Paddington to the city. In 1850 Thomas Tilling started horse bus services, and in 1855 the London General Omnibus Company (LGOC) was founded to amalgamate and regulate the horse-drawn omnibus services then operating in London. In the 1980s the government of Margaret Thatcher decided to privatise the bus operating industry in the Great Britain. Back home during 1981-84 – we relished going to DG Vaishnav College in Arumbakkam by Pallavan bus – 27G (27B was the regular) – and the genial conductor by name Ganesan. It was a ride to remember starting Triplicane around 0825 and reaching Arumbakkam in an hour !. Pallavan buses were initially Red in colour; later Green and much later Golden yellow; – incidentally 27G was Red Ashok Leyland bus ~ now do you travel by city buses still or drive your way in the city traffic or prefer the autos ? or when was the last time, you travelled in bus inside the city ? 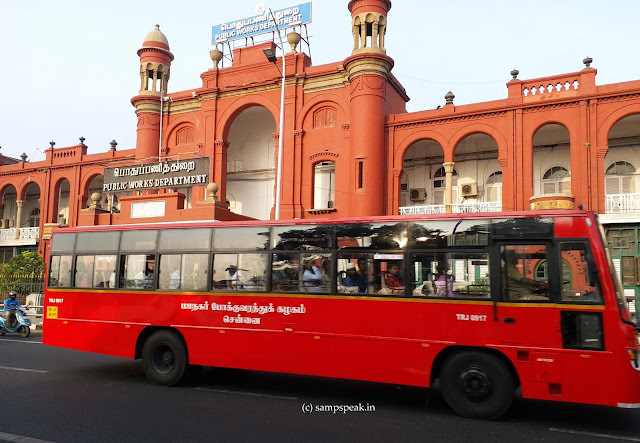 In the city of Chennai, presently buses are operated by the Metropolitan Transport Corporation ~ the same Corporation was earlier known as PTC - Pallavan Transport Corporation. The transport corporation was established on 1 January 1972 with a fleet strength of 1029 buses. The operational jurisdiction was restricted to Chennai Metropolitan area only. Pallavan Transport Corporation was split into two and a new Corporation, namely, Dr. Ambedkar Transport Corporation Ltd. started functioning in 1994. In 1997, more changes saw, Pallavan Transport Corporation being renamed as Metropolitan Transport Corporation (Chennai Division –1), Ambedkar Transport Corporation renamed as Metropolitan Transport Corporation (Chennai Division-II). In 2001, amalgamation took place and now it is MTC. …… then there is the State Express Transport Corporation (Tamil Nadu) Limited (formerly known as Thiruvalluvar Transport Corporation), again a state-owned Transport Corporration that runs long distance express services exceeding 250 km and above throughout the state of Tamil Nadu linking all important capital cities, historical places, religious places and commercial places etc., and adjoining states of Andhra Pradesh, Karnataka, Kerala and the Union Territory of Pondicherry. This corporation operates Semi-Deluxe, Super-Deluxe, Video coach and ultra deluxe buses. Earlier it was Thiruvalluvar Transport Corporation (TTC) During early 1990s, it was then bifurcated as J Jayalalitha Transport Corporation(JJTC) and TTC in which JJTC operated interstate routes. JJTC was then renamed as Rajiv Gandhi Transport Corporation. Both TTC and RGTC was later merged into one and called SETC in 1996. There were more Transport Corporations based on the operational jurisdiction. Now the long distance Express Services all ply under one name – one entity - State Express Transport Corporation. Recently, Tamil Nadu Chief Minister Edappadi K Palaniswami flagged off 555 new buses that will be included in the fleet of various public transport corporation in the State. As many as, 56 of them has been allotted to Metropolitan Transport Corporation (MTC), which caters the Chennai city. The new buses are built as per the AIS 052 code, uniform standard code for building new buses introduced by Automotive Research Association Of India (ARAI). The code has specifications for building a bus with additional safety features for commuters. The overall cost of the 555 new buses is Rs. 140 crore. The TNSTC (Villupuram) division to receive 82 buses, while TNSTC (Salem) has been given 112 buses. The Coimbatore and Kumbakonam divisions of TNSTC has been allotted 140 and 102 buses respectively. About 63 buses earmarked for TNSTC (Madurai division), said the official statement. With the fleet capacity of 21,678 buses, the eight transport corporations in the state caters about 1.47 commuters a day, added the statement. Here is a Red bus plying in front of another famous Red building – Public Works Department, on Kamarajar Salai aka Beach Road in Chennai. India beats NZ in 2nd T20 - Kuggeleijn in news !! Tim Seifert takes wind out of Indian sails ! Carrom ~ Kajal Kumari won Swiss League !